Apparent Republican nominee Donald Trump has won more raw votes from 18-29 year olds this primary season than likely Democratic nominee Hillary Clinton, even though young voters lean Democratic. Millennials refers to population 18 to 35 as of 2016. Though millennials make up an increasingly large share of eligible voters, they vote at much lower rates than other generations. 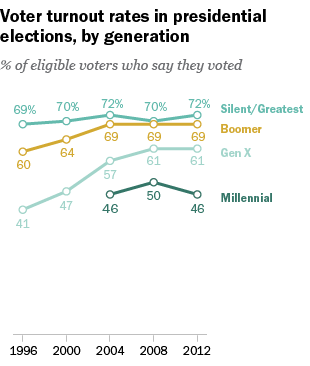 For some perspective, the Silent/Greatest Generation (ages 71+) is roughly 12 percent of the voting pool, while Generation X (ages 36-51) makes up about 25 percent of the electorate. 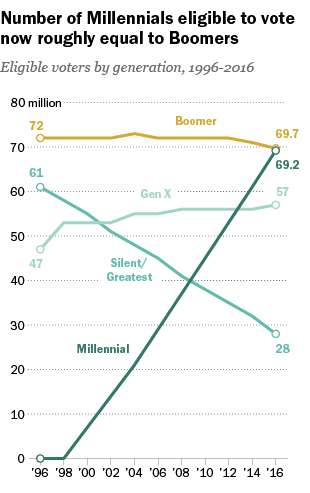 According to the Pew analysis, Baby Boomers reached their peak voting power in 2004. But since then, that population has been dying and declining; while, at the same time, millennials have been aging (turning 18) and increasing as a percent of the voter pool. And, so their political power is likely to grow in the coming years. But, as the Pew analysis points out — this all refers to potential, not actual political clout. In the 2012 election, voters between the ages of 18-29 made up just 19 percent of the electorate — that's HALF the share of the Baby Boomer voting bloc (who were 38 percent of the electorate). In fact, millennials continue to have the lowest voter turnout of any age group. Only about 46 percent voted in the last presidential election; compared to 72 percent of the Silent Generation, who habitually punch above their weight. But, this election is unique for millennials — it marks the first time essentially all the millennials in the country are old enough to vote. "They're maturing, and many of them are facing the third election as young adults, so that is the age where young people would start to transition to more consistent voters," said Kei Kawashima-Ginsberg, the director of CIRCLE, the Center for Information and Research on Civic Learning and Engagement, at Tufts University - an initiative to study and boost youth voter turnout. Kawashima-Ginsberg has studied changes in voter turnout over time - by looking at how millennial turnout compares to Generation X and Baby Boomers when they were young (essentially the same age as the current millennials), and she doesn't see a huge difference — it seems young people when they're young tend to be lax voters. "People do become more stable and consistent voters over time but it's not a straight line, where you start voting and keep going up in the ranks," she added. Still, she acknowledges millennials don't vote reliably compared to their elders. She says the fact that young people move around frequently can be a "huge barrier" to voting. Plus, she points out that campaign outreach often overlooks young voters. Kawashima-Ginsberg says turnout this cycle depends partly on how the presidential campaigns engage young voters. So far in the primary season, Bernie Sanders has the clear advantage with young voters. 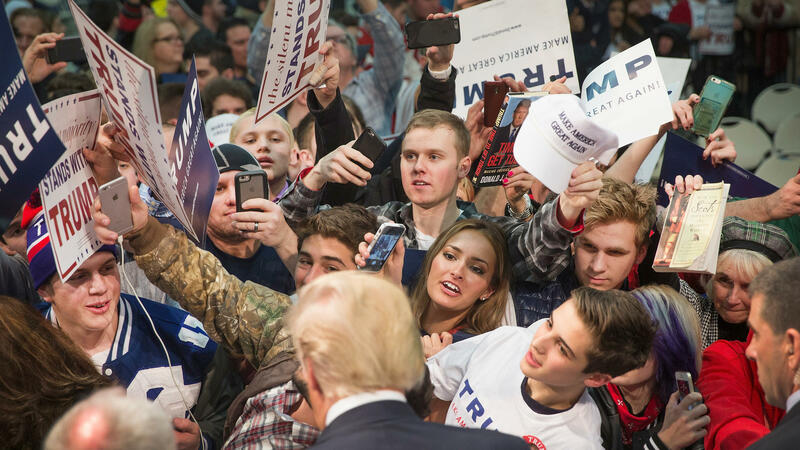 An analysis of state exit polls shows he has captured more than 2 million raw votes from 18-29 year olds; and if Hillary Clinton is the Democratic nominee she'll need to find a way to mobilize that demographic. In fact, even though millennials lean Democratic, Donald Trump has actually won more raw votes from 18-29 year olds during the primaries so far than Clinton, according to exit poll estimates from CIRCLE. But, at the same time — young voters seem to be leaning left more than before, according to John Della Volpe, the director of polling at Harvard University's Institute of Politics. He's polled young voters three times in the past year, asking the same question: "Which party do you prefer to win the 2016 campaign for president?" His most recent poll on that question shows the strongest support for a Democrat in the White House come November. "We recorded the highest number of young people participating in Republican primaries this year in almost every state that we looked at by substantial numbers ... so that's an indication that the conservative youth have been very excited by this election," said Kawashima-Ginsberg. She says young people have the potential to influence elections, particularly in battleground states. But, it's a matter of whether they show up on election day.